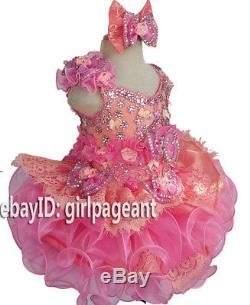 Beautiful National Pageant Dress Made for Lovely Little Princess. 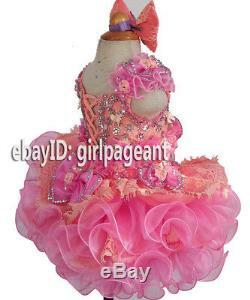 It is one piece dress. Bodice made of stretch jersey , very soft and comfy against baby's skin. And lace on the bodice. The skirt has layers of organza ruffles. Height: 34 (86.36 cm) Weight: 26 - 30 lbs Chest: 19 (48.26 cm). 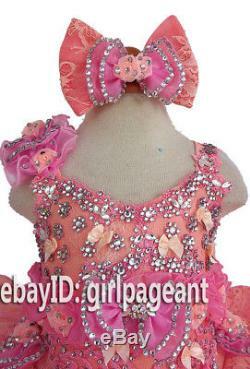 The item "Infant/toddler/baby/girl Lace Bows Crystals Pageant Dress 2T G274" is in sale since Monday, March 26, 2018. 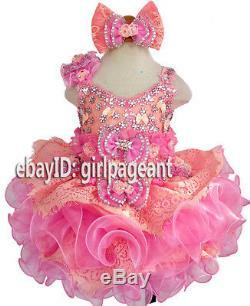 This item is in the category "Clothing, Shoes & Accessories\Baby & Toddler Clothing\Girls' Clothing (Newborn-5T)\Dresses". 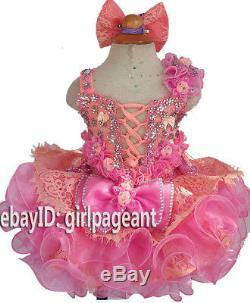 The seller is "girlpageant" and is located in Columbus, Ohio. This item can be shipped worldwide.